Depending on the time of year there are a variety of seating areas available to enjoy a drink at Maria’s. 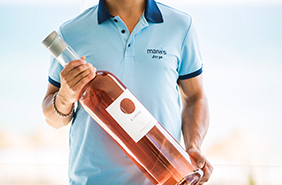 We have a large selection of wines and our experienced bar staff make an excellent range of sangrias and cocktails. You might also choose to visit Maria’s for an afternoon coffee and sample one of our delicious home made cakes. 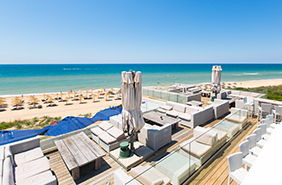 In May 2014 we opened our roof terrace and bar where you can enjoy magnificent panoramic views of the ocean looking down onto the beach or watching the sun set over the Atlantic. 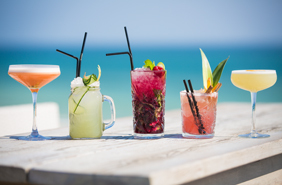 Now, in 2018 you will see it is even bigger and better with a large bar where our mixologists are on hand to prepare fabulous cocktails. We have new bar stools and high tables as well as sofa seating and standing space. This area is ideal for pre or post dinner drinks but we also offer a new “bites’ menu for those that do not want a full meal. There are no reservations for the roof terrace and it is reserved for those aged 16 and over only. The roof terrace is opened at various times during the day and evening depending on the time of the year and weather. During high season it is open from 1pm onwards. On the Deck you will find bar stools and high chairs, ideal for a quick drink after the beach. It is also ideal for families with younger children who like to run up and down the bridge to the beach. In high season The Deck and bridge is also used as a popular area for “al fresco” dining.